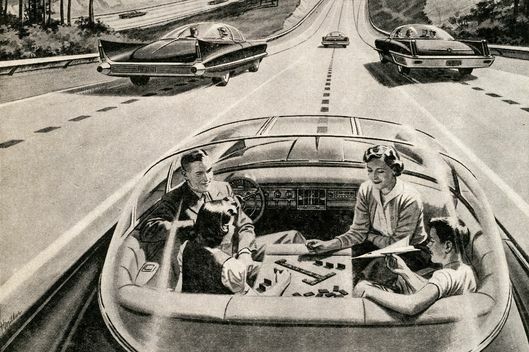 next April 3, 2015 4:47 p.m.
Highway driving, cutting down car ownership, enabling online shopping. On Tuesday, a driverless Audi SQ5 arrived in Manhattan after leaving San Francisco nine days earlier. It covered 3,400 miles, touched 15 states, and became the first autonomous vehicle to drive from one coast to the other. The car navigated traffic circles, managed dangerous weather conditions, and stayed safe in the face of the highway’s biggest menace: other drivers. The trip was largely a PR ploy (the car arrived in Manhattan just in time for the New York Auto Show), but the unpredictability of a long drive on public roads provided Delphi, the British automotive-parts company that designed the autonomous driving system, an opportunity to see what its robot could do. In one instance, the car crossed a steel bridge without issue, even though engineers feared the metal would make the car’s radar system go haywire. “I saw that bridge coming, and I thought, ‘Oh my gosh, this is gonna be a grab the wheel moment,'” Delphi’s Katherine Winter told Wired. Though the autonomous car kept control across the bridge, that wasn’t true of the whole trip. It only drove itself on highways. Humans took over in cities and when police or construction necessitated it. That’s important to note — it's a clue to how we might one day use driverless cars. Will they be more like ferries that we must shepherd to the highway? Or will the technology improve enough to navigate city streets? Google’s self-driving car was carving up city streets in relatively calm Mountain View, California, this time last year. But the biggest tests of autonomous city driving will begin this summer in Ann Arbor. In July the University of Michigan, in collaboration with the state and giant automakers, will open a 23-acre fake city populated by robot pedestrians and autonomous cars. The facility, Bloomberg reports, will have “40 building facades, angled intersections, a traffic circle, a bridge, a tunnel, gravel roads, and plenty of obstructed views.” The whole thing is called Mcity, and it will provide driverless cars opportunities to navigate customizable obstacles, including careless pedestrians and crummy weather. It will also have autonomous cars operating side by side, a rarity on public roads. The University of Michigan is also working on puzzling out how people might actually use these vehicles, and one new study argues that driverless vehicles will create a new culture of car sharing. Car ownership, the study suggests, could decrease from 2.1 cars per household to 1.2, thanks to what researchers call a “return to home” feature. Think of it like this: After your autonomous car drops you at work, it can return home to shuttle your spouse around all day. Later, it can come back to your office to take you home. Another study, this one from consulting firm McKinsey & Company, has its own intriguing projection: Once driverless cars are on the road, people will find themselves with 50 minutes more free time each day. The study's authors suggest much of that time will be spent online, likely shopping, perhaps for a new onesie.